Walk into the city through The Almocábar Gate, one of the main entrances to the fortified city of Ronda. Discover The Plaza de Toros de la Real Maestranza is considered as the cradle of bullfighting. Is one of the most ancient and picturesque bullrings in Spain. Enjoy the city of wines. The Bodegas Sangre de Ronda opens its museum and offers the chance to taste its best wines. 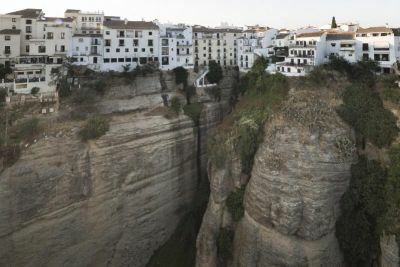 After that and once reaching the village of Ronda , you will enjoy a sightseeing guided tour of its main attractions including Puerta de Almocabar (Almocabar Gate), the Iglesia del Espiritu Santo (Church of the Holy Spirit), the Town Hall Square, and the Iglesia de Santa Maria la Mayor (Church of Santa Maria la Mayor). Guided tour of its main attractions including Puerta de Almocabar (Almocabar Gate), Iglesia del Espiritu Santo (Church of the Holy Spirit), Town Hall Square, etc. Then we will visit the Plaza de Toros de la Maestranza, considered the birthplace of traditional bullfighting and enjoy the visit of the bullfighting museum inside. After this, we will go to a local winery called Bodegas La Sangre de Ronda, a wine museum that explores the historical and cultural impact that wine has had on this region. Fully-equipped motor-coach with English speaking official local guide.